For guests planning a stay during Thanksgiving, Kimpton Angler’s will be making a special delivery to each guest. In the spirit of thanks, on November 22, guests will each receive a thank you note accompanied by a mini-pie to enjoy in their room. In December, Kimpton Angler’s puts the holidays in high gear with striking holiday décor, seasonal scents, and a holiday mail box to Santa for greeting cards and letters to the North Pole. Miami inspired coquitos and mulled wine will be the featured attraction during the hotel’s daily evening social hour, with Kosher wine added during the Festival of Lights for those celebrating Hanukkah. 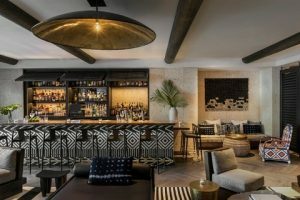 Throughout the month, Minnow Bar will feature an over-sized calendar counting down the 30 days until Christmas with a schedule of holiday movies, daily specials, holiday-themed cocktails, and milk and cookies served each night. Hotel staff will also get into the spirit of the season wearing ugly sweaters on every Friday in December. Guests will have an opportunity to get in on the fun and enjoy a special buy one get one promotion at Minnow Bar if they don their own ugly sweater on Fridays. Art afficionados in town for Art Basel Miami Beach (Dec. 6-9), one of the largest international art festivals hosted annually in the City of Miami with elaborate exhibition sites and coinciding events spread across South Beach’s Art Deco District, will enjoy a special exhibition throughout Kimpton Angler’s public spaces. In partnership with Avant Gallery, located at Kimpton’s EPIC Hotel, Miami and Mugello Gallery, Los Angles – Kimpton Angler’s invites artist Matthew Adam Ross to take over the newly renovated and re-designed space with large-scale renditions of his sculptures and paintings. Several works will be intertwined with the hotel’s exterior, with additional freestanding, and interactive works that can be viewed in direct proximity to its restoration in homage to its past which dates back to the 1930s. During Christmas week, Kimpton Angler’s will host pictures with Santa in the lobby on Dec. 24 and serve up surprise treats throughout the day on the pool deck on both Christmas Eve and Christmas Day. Then its candy canes for all on Dec. 26, also known as National Candy Cane Day. The bubbly starts to pour early on New Year’s Eve with complimentary champagne served during social hour and a photo booth on hand for guests to snap a pic before the clock strikes twelve. Kimpton Angler’s helps guests start 2019 right with a “New You” morning fitness session, and more complimentary bubbly served throughoutNew Year’s Day. 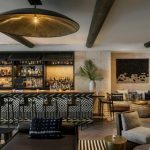 Conceived by San Francisco-based interior designer Nicole Hollis, Kimpton Angler’s mood-setting design elements are an enchanting play of light against dark creating stunning contrasts with the use of raw materials, exquisite hand-hewn works, and custom-designed pieces. The result is an aesthetic that is both sophisticated yet raw; rough but with polish. Kimpton Angler’s new design and added guestrooms are part of a recently completed addition which also houses the hotel’s new rooftop pool and sundeck, and the newly-opened Minnow Bar, which celebrates clear spirits with a rotating array of gins, vodkas, piscos, cachaça and agave spirits infused with fresh local herbs to create original and classic cocktails. The hotel also launched a wellness program that includes complimentary daily cardio classes and in-room spa services. Kimpton Angler’s uncommon mix of accommodations includes 132 guest rooms offering spacious floor plans ranging in size from 400 to 1,000 square feet and consisting of modern and airy studios with lush terraces offering sunrise and sunset views; two-story lofts with cozy living area and a spiral staircase leading up to a second bedroom level; two-story villas situated amongst lush gardens with their own secluded private entrance; two-story spa villas with two full baths, private patio and Jacuzzi; and three-story poolside bungalows with private rooftop terrace, outdoor shower and lounge area. Guests of Kimpton Angler’s will continue to enjoy all of Kimpton’s beloved amenities and experiences including hosted nightly wine hour, complimentary morning coffee and tea, PUBLIC bikes, yoga mats, luxurious Atelier Bloem bath products; “Forgot It? We Got It!” menu of travel and vacation essentials; a thoughtful mini bar stocked with local favorites; and free Wi-Fi for IHG Rewards members. Kimpton Angler’s is also pet-friendly. In addition, hotel guests can avail themselves of on-the-go beach bags, towels and umbrellas to use at their leisure; a second heated adult-only pool; on-site parking and valet; and 24-hour in-room dining.